When I think of architecture and show, my mind makes all kinds of associations. First, I am hard pressed to think of an example of architecture that doesn't represent (show) something, and in that sense all architecture could be seen as some kind of show. Next, I think of how architecture is usually shown in photographs, that is, usually without people in the same picture. Could this be an indication of the autonomy that architects like to perceive in architecture? I'm reminded of a story an architect/friend's wife told about visiting Le Corbusier's Villa Savoye. There were a handful of other architects there, and not only was each of the architects taking virtually all the same pictures, but they were all making sure not to get each other in any of the pictures. I immediately thought the best pictures would have been of the architects doing this; at least that would have been a unique set of pictures. Could it be that the presence of people in architectural photographs takes away from architecture's (preferably?) perceived autonomy? From here I think of Maya Lin's comments on the FLW/PBS show, where she says that Wright wanted far too much control of his designs (particularly in the cases where Wright designs all the interiors down to the smallest details and furthermore sets everything in a specific position). This is a great comment coming from the very artist whose Vietnam Memorial is exactly so great because of the people that visit and leave things there, and who, in there very own reflections in the wall of names, become a part of the monument itself. Finally, I think of K.F. 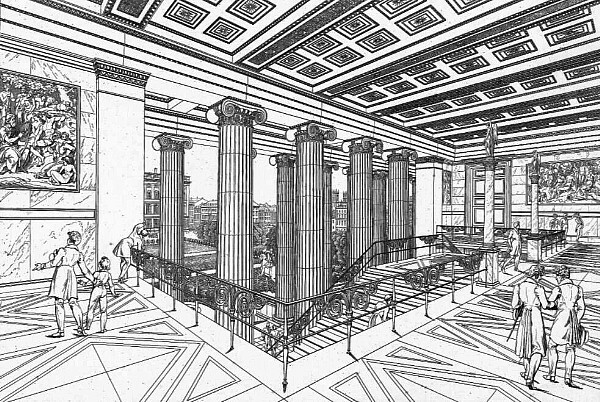 Schinkel's perspective of the upper balcony of his Altes Museum where he shows visitors to the museum standing as if stuck with awe of the architecture and its murals. Is it OK to have people within architectural images as long as they're showing high respect for the building? ...the sequence of entry into Schinkel's Altes Museum in Berlin is a classic example of osmotic architecture. Regarding the definition of limbo architecture, I have no problem with you submitting the definition alone, however, if you want to do it jointly that is fine as well. today, I remembered that the inside-outside coexistence in some architectures also falls under what I consider osmotic architecture--the equal exchange of inside and outside, e.g., Pantheon, Kahn's Kimbell Art Museum, porch/stair hall of Schinkel's Altes Museum. In light of this, I think the inside/outside distinction of limbo architecture needs some further consideration. I like limbo architecture's notion of becoming, and I also think the notions of restraint and neglect should be added to the definition. Since I see osmotic architecture as the manifestation of something sacred, perhaps limbo architecture is the profane counterpart of osmotic architecture, or maybe (even better) limbo architecture exists within the thin realm between profane and sacred. osmotic architecture is 'uplifting' whereas limbo architecture is striving? ...I will attempt to write out the promenade architecturale formula I believe Le Corbusier followed. Both the Villa Savoye and the Palais des Congrès are essentially boxes raised on pilotis with a continuous ramp connecting three distinct levels. All three levels in each building and their relationship to the ongoing ascent of the ramp are part of the promenade formula. The lowest level, under the raised box, is symbolically the most mundane, and here Le Corbusier enacts a forest of pilotis within which the perimeter of the building is recessed--significantly, the entry point and the beginning point of ascent (ramp) are nearly synonymous. As one begins moving through the buildings, one is also ascending. The second level, the box, symbolizes the realm of limbo, the in-between, part inside and part outside. For Le Corbusier, this is realm where we live (Savoye) and where we gather (Congrès). Ultimately, the ramp in both buildings raises us to the garden on the roof in the realm of the sky. For Le Corbusier, this is architecture's goal, this is where architecture should deliver us. What makes this formula even more interesting is that it is evident in other buildings, by architects other than Le Corbusier, and both after and before Le Corbusier's time. First I found the very same formula implemented in Stirling/Wilford's Wallraf-Richartz Museum, Cologne, 1977. Just as Le Corbusier elaborates and distorts the formula late in his life within the design of the Palais des Congrès, Stirling too further distorts the promenade route at Cologne (an unbuilt design within Quondam's collection). Then, after several years, I found the same promenade architectural formula with Terragni's Danteum, and here the formula is even more clear, both symbolically and formally--first the forest, then the dark concentrated interior of the Inferno, then the inside-outside realm of Purgatory (limbo), and finally Heaven with its invisible columns and invisible roof. Again, an ongoing passage of ascent leading to an ultimate goal. Form here I now see the promenade architectural formula present in Schinkel's Altes Museum, Berlin, the Pantheon in Rome, and even along the via Triumphalis as delineated by Piranesi within the Ichnographia Campus Martius.